Even super heroes are not immune from the horrors of this corporate holiday. Behold: Mr. Miracle is not having a good Valentine's Day. Thanks, Supes! 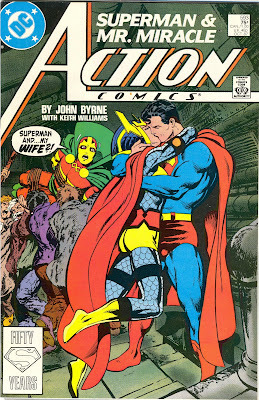 Who knew that the Man of Steel fancied Big Barda? For more on why Superman embarked upon this enterprise, see here. The answer is not pretty.